5 Reasons to go to Colombia a�� Now! Colombia has changed a lot since its days of drug cartels and merciless kidnappings. Of course, wherever you are travelling you need to be sensible, but Colombia has developed into one of the top countries to visit in Latin America, and rightly so. Fronting both the Pacific Ocean and the Caribbean Sea, Colombia has some of the most pristine beaches and paradisiacal islands in Latin America. From Playa Blanca to Santa Marta there are too many stunning spots to mention, but the archipelago of San AndrA�s y Providencia is a must-visit if you dream of private sunbathing and unspoilt coral reefs. Go before the masses discover these precious gems of relaxation. 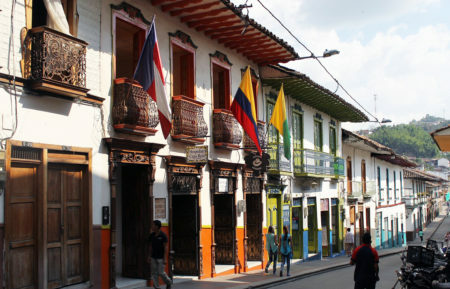 The Colombian Spanish accent is known to be very neutral and Colombia is said to have one of the highest standards of Spanish in Latin America. Other Latin American destinations have a dense number of vocabulary variants which can make comprehension difficult. Another bonus is that the Colombian people are super friendly and are usually happy to practise your Spanish with you. There is always a festival or carnival happening in Colombia. Whatever the reason for the celebration Colombians like to put on a show and celebrate with all their heart. They have such a variety of festivals that there is bound to be something to interest everyone. If you are looking for a high then Colombia can offer this in the form of the best coffee in the entire world. If you cannot operate without your morning espresso why not visit a coffee farm and see how they make it. Bogota is Colombiaa��s centre piece a�� historical, modern, and fast paced, Bogota has propelled itself into the 21st Century with a huge growing and successful middle class. Bogota has everything you would expect from a capital city, and something more. Cactus language offers Spanish language courses in Bogota and Cartagena .To book any of our courses please call us on 01273 830 960 or email us. Our multilingual team will be happy to answer any questions you may have.